On Wednesday evening, 27 March, Rasmea Odeh‘s voice and words were heard in Berlin, Germany, despite a harsh, repressive campaign that included yet another ban on her speaking in person issued by Berlin’s Senator for the Interior. The successful event at be’kech in Berlin’s Wedding district brought crowds to the space despite a large police presence; the space was so crowded that many people stayed outside to watch the event through glass windows. The evening marked a significant achievement for Rasmea Odeh and all those defending the right to organize and advocate for Palestine in Berlin. Despite all attempts to prevent it from taking place, Rasmea’s voice was heard in Berlin and celebrated by people of conscience. Once again, as was the case on 15 March, when Rasmea was to join Palestinian poet and former prisoner Dareen Tatour for an evening of solidarity and celebration of Palestinian women’s struggle, the venue itself was subject to harassment and threats. Another media smear campaign was launched against Rasmea along with attempts to demand that she once again be prohibited from speaking. On Wednesday afternoon, only hours before the event, Berlin Interior Senator Andreas Geisel, an SPD politician who had earlier declared that speaking “against the state of Israel” crossed a “red line” that justified the violation of freedom of speech, once again banned Odeh from delivering a public speech at the event. However, organizers presented a video from Odeh, ensuring that her message and her story would be able to be heard by supporters in person and everyone around the world who supports her and the struggle for justice in Palestine. Once again, several vans of police filled the area (although a smaller presence than that surrounding the 15 March event). They searched the crowd for Rasmea, but left partway through the event after it was clear that she was not attending in person. A claimed counter-demonstration by pro-apartheid Zionist organizations was not immediately visible, but there may have been several participants at the corner of the street. The moderator of the evening opened the event with a stirring call against the silencing of oppressed and marginalized people, especially Palestinian women. She noted the growing support received by the event and the campaign to defend Odeh by a number of organizations, including the Internationale Liga für Menschenrechte, which sent a statement to the organization. The event was supported by Samidoun Palestinian Prisoner Solidarity Network, Berlin Muslim Feminists, Bündnis gegen Rassismus, HIRAK (Palestinian Youth Mobilization, Berlin), The Coalition Berlin, Bloque Latinoamericano Berlin, Brot und Rosen international socialist women’s organiation, Revolutionäre Internationalistische Organisation – Klasse Gegen Klasse, Berlin Against Pinkwashing, Jüdische Stimme für gerechten Frieden in Nahost (Jewish Voice for a Just Peace), RefrACTa Kollektiv Brasilien-Berlin, BDS Berlin and the Kali feminist collective. The event also included a speech by a Palestinian student on behalf of HIRAK, emphasizing that this week also marks the one-year anniversary of the Great March of Return in Gaza. Just this week, Israel has been shelling Gaza, causing further destruction after taking hundreds of lives in the past year as Palestinians participated in collective, popular protests for their right to return and break the siege. She urged people to get involved in struggles here in Berlin, including Palestinian community organizing, the solidarity movement and the BDS campaign. The screening was followed by a 20-minute video presentation – the main speech of the night – in which Rasmea discussed her situation in Berlin as well as presenting more broadly on Palestinian women, Palestinian prisoners and the continuing struggle for liberation. Full video coming shortly! Rasmea Odeh, born in 1947, is a lifelong struggler for Palestine and a well-known feminist organizer and activist. After surviving torture and sexual assault under interrogation by occupation forces and serving 10 years in Israeli prison, she came to the United States, where she organized over 800 women in Chicago in the Arab Women’s Committee, a project of the Arab American Action Network. In 2013, she was targeted by the FBI and U.S. immigration authorities and accused of lying about her time in Israeli prison, despite the fact that it was publicly known; she even testified before a Special Committee of the United Nations about her experience under torture and imprisonment. After a years-long court battle that won widespread grassroots support, she was deported to Jordan in 2017. She was one of the initial signatories of the call for the International Women’s Strike. After she was invited to speak in Berlin on 15 March, the U.S. ambassador (with ties to the German far right) Richard Grenell, Israeli Minister of Strategic Affairs Gilad Erdan, charged with fighting Palestine solidarity and the BDS movement internationally, and the Israeli ambassador in Germany launched calls to censor her. Media propaganda falsely labeled her an “anti-Semite,” when she is in reality a longtime anti-racist struggler who developed strong connections with other oppressed communities, particularly the Black liberation movement. In the U.S., Angela Davis and Jewish Voice for Peace were among her supporters. In this context, Berlin politicians yielded to the demands of Trump and Netanyahu, and when Rasmea arrived at the event location, she was given a sheaf of papers. Her Schengen visa was ordered cancelled and she was directed to leave the country; she was banned from speaking at the event. Most of the allegations in the documents simply restated attacks by pro-apartheid media publications, including labeling the BDS campaign “anti-Semitic”. The German authorities also claimed that allowing Rasmea to speak and retain her visa would “damage the relationship between Germany and Israel.” Thus, Rasmea Odeh’s voice, experience and analysis was ordered suppressed and silenced through the joint complicity of the German, U.S. and Israeli governments. Rasmea is committed to fighting back in court. Her lawyer, Nadija Samour, said that “cancelling a visa based on what has happened so far in the past is a completely new concept from a legal point of view.” However, she and her supporters are aware that this is not simply a legal question but a clear political battle that requires support from the broadest number of people in Germany and internationally. 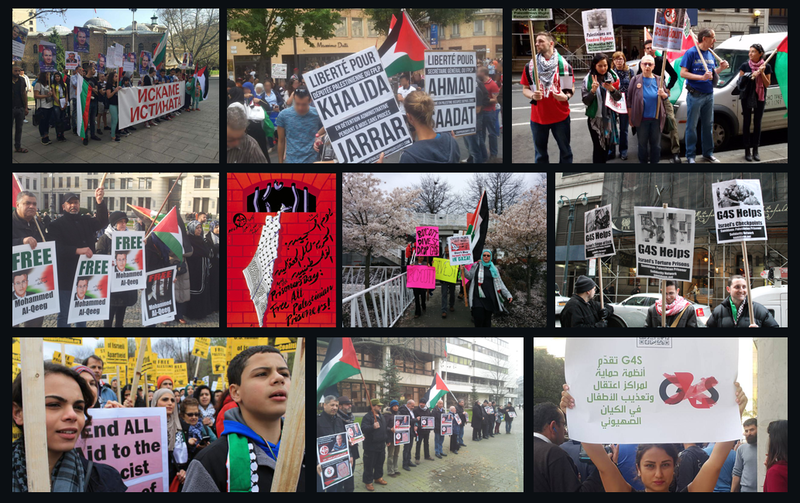 Supporters of Rasmea in the United States, including the US Palestinian Community Network, Committee to Stop FBI Repression, Rasmea Defense Committee and many other groups have worked to support the growing campaign in Germany, and more organizations have been adding their voices to express support for Rasmea. By cancelling her Schengen visa, German officials are not only attempting to silence Rasmea’s speech in Berlin but to prevent her from traveling elsewhere in Europe to speak about her experiences and her views – thus denying people across the continent the opportunity to hear from a leading transnational feminist and Palestinian organizer. Rasmea was ordered silenced based on a desire to stop her from sharing her words and her experience, telling her story and presenting her analysis. The U.S. government is apparently committed to chasing Rasmea around the world in order to persecute her wherever she goes; meanwhile, the Israeli state continues its intensive attack on people’s right to support Palestine everywhere in the world, which has included the promotion of anti-BDS laws and falsely labeling Palestinian human rights defenders and solidarity groups as “terrorists.” The German state and Berlin authorities also chose to join this campaign, issuing two separate bans in less than two weeks against Rasmea Odeh to prevent her from delivering a live speech about her experiences, her involvement in women’s organizing and her view of Palestine. In many ways, Rasmea’s case does not stand alone; in Germany, it comes alongside the Humboldt 3 case and the prosecution of activists for speaking up against war crimes, attempts to block Palestine events from taking place in any location and far-right campaigns particularly targeting migrant communities. It also comes alongside the pursuit of anti-BDS laws in the US, the use of “anti-terror” frameworks to criminalize Palestinian community work and the use of visa denial to suppress political and cultural expression, such as in Australia’s recent denial of a visa to Palestinian American poet Remi Kanazi. In a particularly disturbing media article containing propaganda against Kanazi, pro-apartheid groups demand that Kanazi is barred for, among other things, supporting Rasmea and other Palestinian political prisoners. They also use the recent far-right, white-supremacist massacre in Christchurch, New Zealand, as a justification for banning him, despite the fact that this was an attack targeting Muslims, linked to racist, anti-Muslim and anti-Arab propaganda, based on white supremacy, and which took the lives of a number of Palestinians specifically. It is clear that there is a global attack, backed by Erdan and the Israeli government, aimed at all Palestinians and supporters of Palestine – and especially aiming to isolate Palestinian prisoners from the international movements that continue to defend their rights. The campaign to defend Rasmea Odeh is not ending with this event – instead, it marks a strong beginning of a resurgent movement against the silencing of Palestinian women and for justice in Palestine. It also made it clear that Palestinian women, on the frontlines of struggle from inside Israeli prisons, to the Great Return March in Gaza to organizing for justice in Berlin, will not be silenced. Samidoun Palestinian Prisoner Solidarity Network urges people and organizations around the world to get involved and join this campaign by following the Facebook page, Rasmea spricht (Rasmea will speak) and sending statements of solidarity to samidoun@samidoun.net.